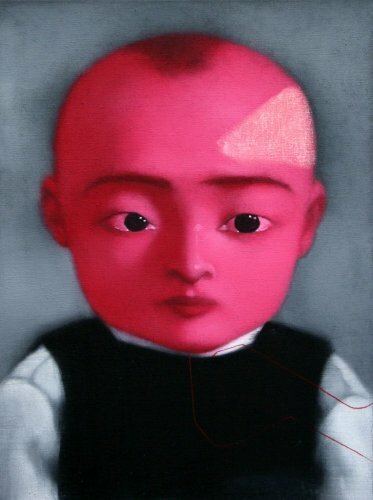 Zhang Xiaogang’s deeply psychological and surrealist paintings are largely drawn from his past experiences during the Cultural Revolution and his Chinese identity in which the notion of collectivism was greatly imbedded. 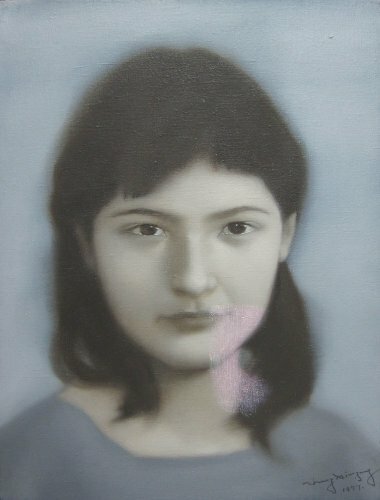 Inspired by family photos from this period and the complex thoughts in the context of China’s history versus reality, the paintings from his Bloodline series consist of subjects in formal photo studio poses and their anonymity and timeless presence are further highlighted by the use of the grey scale palette. Under the surface of tranquillity and stillness the subjects seem to struggle in their disturbing inner worlds as if entering into a surreal state in between reality and dream. The occasional splotches of colour can be subjected to different interpretations, such as reminiscent of birth marks, aged film, social stigma, or a lingering sense of the subject’s self assertion. His works have never departed from an underlying sense of introversion and privacy in order to express the character of the individuals.